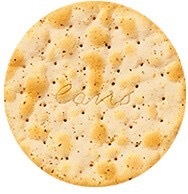 Part of the humour of the piece is that the two Cracker Packers are standing atop a 90cm-wide Carr’s Table Water Biscuit. How do I go about sculpting a giant biscuit? That’s a new one on me too. The final bronze needs to look biscuit-like – crispy thin, with the wonderful undulations that the baking process brings about. First, research. This involves spending a lot of time looking at these biscuits. I need to renew supplies regularly as I have often eaten my reference biscuits. I draft in my graphics-trained artist sister again, Sandra Reeves. As I finish working on the Cracker Packer figures Sandra starts mapping out in clay the undulations and perforations of the biscuit. She also plans out (see photo of her with the template) and cuts out the embossed Carr’s logo that goes across the centre of the giant biscuit. I work across the clay surface of the biscuit developing the undulations and the perforations. This is a slow process but it has to look convincing, from above and the side views. …and here’s the biscuit; ready for moulding and casting in bronze.